When you use Post Tuition Fees, you can have a family specific discount applied to any tuition fees posted. This is often used for volunteers, staff, etc. that are given a discount over and above any multi-class and multi-student discounts that you offer. The Family Discount, which can be a dollar amount or a percentage, is applied to the tuition amount after your other discounts have been calculated and applied as per the class Tuition Discount Rules. In the Family record select the Billing Info tab. Enter a discount in the Family Discount field (the discount can be an amount or a percentage). Select the Discount Type (Amount or Percentage). Assign an Exp Date (optional). Family Discounts are not deducted from Family Fixed Fees. Family Discounts are deducted from Student Fixed Fees. The discount is posted after all Student Fixed Fees are entered. Example: A family has two students and both students have a Fixed Fee of $100. The Family Discount is $10.00. Both Student Fixed Fees are posted at $100 each. The discount of $10 is subtracted from the total ($100 + $100 -$10=$190). 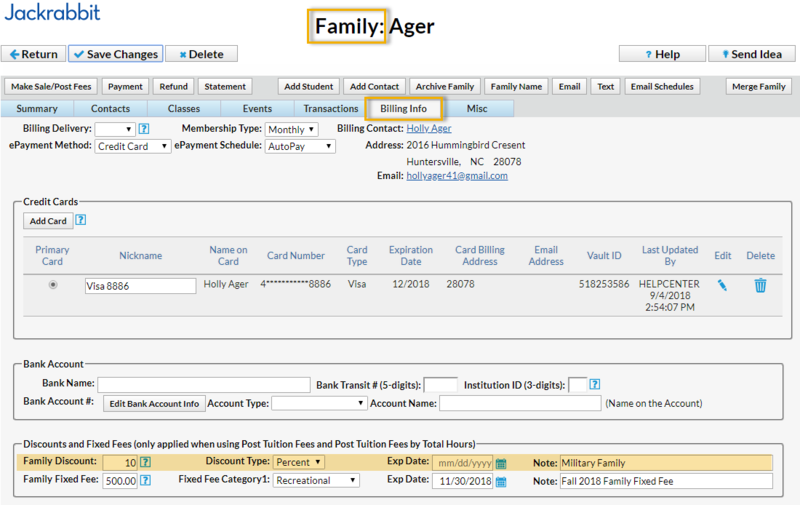 You can set the Family Discount to expire on a specified date. After an expiration date has passed, the discount will be ignored when posting tuition fees.